GardenTones Collection of beautiful Outdoor Planters caters to the needs of real gardeners. 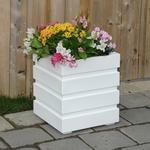 Most GardenTones Planters are built using wood alternatives such as polyethylene and ceramic. Polyethylene provides the look of wood without the maintenance and care, and ceramic provides stunning, eye-popping glazes to really make your home and garden shine. Many GardenTones planters even carry warranties of up to 20 years! ... Give your plants a beautiful, comfortable bed to sleep in tonight with one of GardenTones practical and stylish planters!